By Caitlin BowlingAs the Eastern Band of Cherokee Indians’ leaders mull the fate of bear zoos on the reservation, representatives from two of Cherokee’s three bear zoos have said they are being unfairly harried because of one bad egg. Federal regulators closed Chief Saunooke Bear Zoo in Cherokee last month amid a myriad of animal welfare violations, but animal rights activists and some enrolled members of the Eastern Band have denounced all bear zoos—including Cherokee Bear Zoo and Santa’s Land. Collette Coggins, an enrolled member and owner of Cherokee Bear Zoo, has cried foul after her establishment was lumped in with Chief Saunooke Bear Zoo. “We take a lot better care of our bears than some people take of their children,” Coggins said. But she did not claim her bear zoo is the picture of perfection. 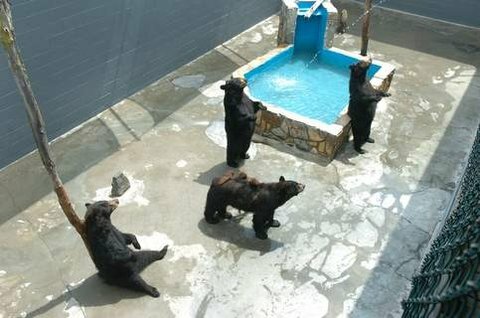 Cherokee Bear Zoo’s 10 bears live in concrete pits, which have been decried by critics as cruel. The bears have logs to scratch and chew on, but there is no natural vegetation. Although Cherokee Bear Zoos is up to snuff when it comes to federal regulations, Coggins admitted that simply meeting standards isn’t enough. After nearly two decades of showcasing bears in concrete pits for paying tourists, Coggins acknowledged sensibilities over what constitutes an adequate environment for the bears has changed. “We realize now that they need to be upgraded,” Coggins said. “We want to do better.”Comment: For more on the Cherokee bear parks, see Cherokee Elders Want Bears Freed and Feds Shut Down Cherokee Bear Park.